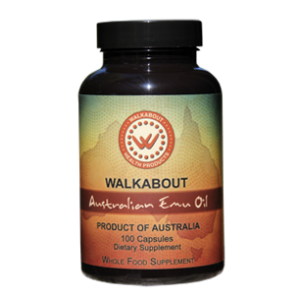 Walkabout Emu Oil Vitamin K2 is an astounding product. It is many times richer in Weston Price’s “X Factor” (Vitamin K2) than specialized butter oil. This oil comes from a genetically unique species of Emu and is the only oil providing the MK-4 form of K2. It provides dozens of nutrients including CLA and Omega 3 and 9 without the burping, taste or smell common with fish oil. Highly anti-inflammatory, it can help many types of inflammation including pain, irritable bowel and auto-immune dysfunction. These Emu are pasture-raised and totally organic. The oil has never been heated or processed as all other emu oil products are. 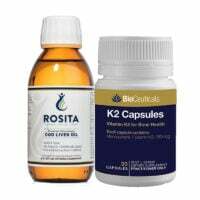 It also comes in liquid form here, great for children to get the K2 needed to form strong strong jaws and teeth, and topically for pain, Psoriasis and more. 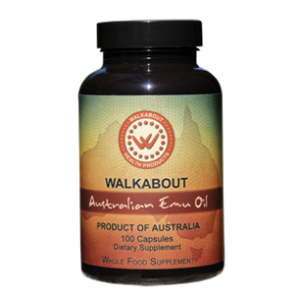 Walkabout Emu Oil is rich in the natural MK-4 form of K2 and many other naturally occurring nutrients. 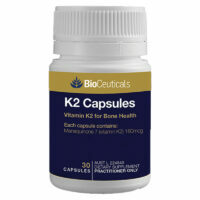 Adults: 2 – 4 caps daily long-term w. food, or 6/day to replete Vitamin K2 and Omega fats. 4 caps provides a 1 tsp. dose. Children: 1 cap daily long-term, or 2/day to replete Vitamin K2 and Omega fats. The capsule may be opened and contents added to food. Or use the liquid Emu oil here. Keep tightly closed. Unopened will last 3 years. 100 capsules per bottle. Australian Emu Oil – 1 gram per capsule provides Omega 3, 6 and 9 and approximately 4.2 mcg. Vitamin K2 as MK-4. This is a whole food from the male emu, with nothing added or removed. It contains nutrients for the Emu to live on while nesting 54 days. Interesting Emu facts! Male emus sit on the nest 6 weeks without food or water. It is this rich fat that feeds them, similar to bears in hibernation. Emu Oil is a sacred Aboriginal food studied by Weston Price. These emu are genetically unique from commercial emus raised for meat, feathers or oil for cosmetics. 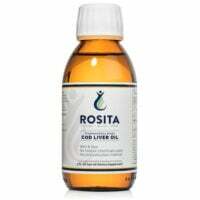 This oil contains small amounts of Vitamins D3 and E as well as CLA (Conjugated Linoleic Acid). Dr. Price said that “Activator X” (Vitamin K2) was a more powerful catalyst for nutrient absorption than A or D. It is highly anti-inflammatory. Here’s one article, another article, and a podcast on the importance of Vitamin K2 in managing Calcium from cradle to grave.